What is Trima 150 Mg (Moclobemide)? 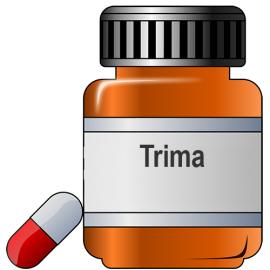 Trima is an antidepressant prescribed to treat varying degree of depression, anxiety and social phobia. It is a new generation reversible Monoamine Oxidase Inhibitor which does not react with other amine drugs. It is safe for use in elderly patients with cardiovascular issues. The active compound in Trima is Moclobemide. It is an antidepressant belonging to the group of the reversible inhibitor of monoamine oxidase. Trima inhibits monoamine oxidase A and B and prevents the decomposition of 3 neurochemicals – noradrenaline, dopamine and serotonin. All three of these are responsible for mood and happiness regulation. Store it at temperatures below 300C and away from moisture and heat. Check expiry before use. Take it by mouth after a meal and as advised by your doctor. Kindly consult your doctor for your prescription. Take it as soon as you remember. If it time for the next dose then skip it. Do not double dose. Use caution while consuming cheese while on this drug. It may cause a hypertensive crisis due to interaction with tyramine in the cheese. Take after a meal to avoid gastric symptoms. Confused patient, adrenal gland tumor, very agitated or excited patient, thyroid crisis, bipolar disease and allergy to MAOIs. How long should you take Trima 150 Mg ?